Which flash drive design should I choose? While each of our customised USB flash drive designs makes an excellent choice, the decision of which one you ultimately select can depend on your intended use for the product. For example, if you are considering using flash drives away as a promotional gift at a tradeshow, you may prefer to select a capacity that closely matches the size of your preloaded custom content. On the other hand, if you are sourcing a business gift you will likely be drawn to a larger capacity model to ensure that it will be retained for an extended period and frequently used. Which designs best match your brand image and message? How much memory capacity would you like to offer to the recipient? What data would you like to have preloaded to maximise the impact of the product? We understand that the uses for customised USB flash drives are varied and that for each project you may have a different set of preferences and requirements. That’s why we constantly tailor our product range to ensure we have stunning designs that can be custom branded to meet your specific needs. 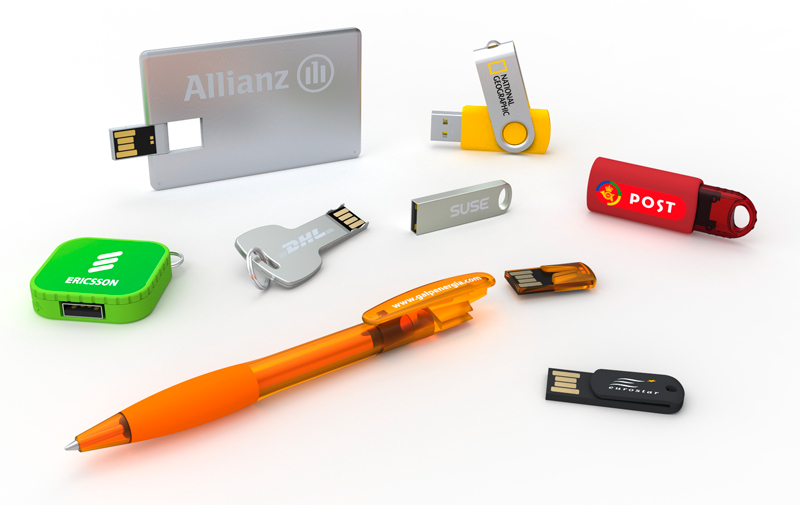 Our salespeople are ready to help you discover a USB flash drive that is perfect for your project – along with the accessories and services that will make sure your offering has ‘that little extra’. All you need to do is complete our short quote form or call us . We will guide you through the order process and in just 6 working days you could have taken delivery of your items and be ready to dazzle your clients, colleagues and competition!